Boo Boo DavisJames Davis was born in Drew. Miss; on 4th November 1943. His father was a share cropper and multi instrumentalist whose friends included Elmore James, Robert Pete Williams, and Robert Petway. 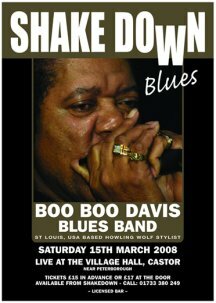 Boo Boo�s earliest memories are of these and other local blues musicians rehearsing at home with his father. By the time James was five years old he had mastered the harmonica and was already singing and playing with his mother in the church. Eight years later he switched to playing guitar and joined his father and older brothers in the family �Lard Can Band�. In the early 60�s Boo Boo moved to East St. Louis, switched instruments again and played drums behind Doc Terry before forming a band with Little Aaron. This tight little band worked solidly in the local clubs and it was during this time that he befriended the late Willie Richardson who spoke so highly of him during his stay with us. In 1999 Boo Boo made his first recordings for Black & Tan Records in Holland and the resulting East St Louis CD was an instant success with high critical acclaim. International tours followed and he at last broke out of the confines of being a local blues artist. Three more well received CD�s followed and major festival dates soon became the order of the day including North Sea Jazz Festival, Holland, Pocono Blues Festival, USA, Nancy Jazz Pulse, France and Colne Blues Festival, UK.